These kumihimo neckpieces have an interesting story. I had made an earlier version with knotted Chinese button for the clasps, it limited the size to one neck size, often the wrong size for an interested collector. Regardless all the pieces were sold. The series got a re-design with a special order - read the blog entry. The 'Blue Turquoise' was only made possible due to many experimental color samples sent to me by C-Lon as I am consulting on future colors of nylon cord. 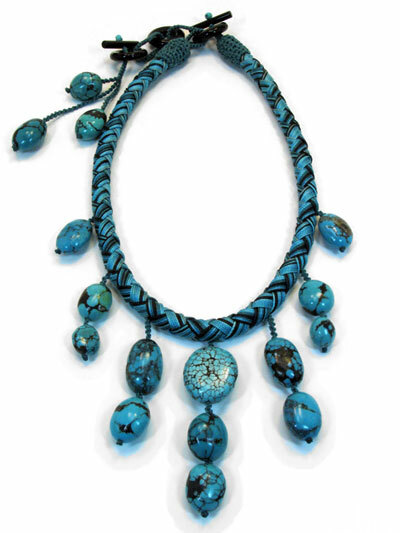 I had these chunks for a long time but no color of nylon cord was a good match for the bright blue turquoises. All the colors including many vintage thread, no longer in production were all too greens. Two of the experimental colors used here will most likely go into production, but several other ones used on this piece were just sample bobbins. So this is truly a unique piece.